More attention to the needs of offenders aged 18-25 is necessary to help them get out of a cycle of crime, a committee of MPs has said. This age group has the greatest potential to stop offending while their brains are still developing, the Commons Justice Committee reported. But it said better screening was needed to identify the help required. 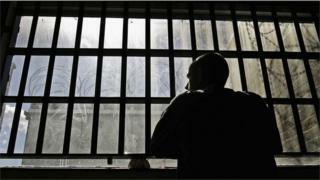 The government said "significant efforts" had been made to prevent young people ending up in prison. The committee's report argued that there was a strong case for treating young adult offenders differently because their brains are still developing up to the age of 25. Offenders aged between 18 and 25 are 10 times more likely to have a learning disability or autistic disorder, it went on. The report also says that "temperance - the ability to evaluate the consequences of actions and to limit impulsiveness and risk-taking" is still developing when a person is in their 20s. It said programmes carried out by the National Offender Management Service did not recognise young adults' needs and could prevent them getting out of a cycle of crime. The committee said it welcomed the Ministry of Justice's commitment to develop a maturity assessment when dealing with young offenders but said that not screening for mental disorders and learning and communication needs was a "missed opportunity". "This is short-sighted as such screening would enable a thorough understanding of individual needs and underpin better informed commissioning decisions for the services young adults need to address their offending," the report claimed. The number of young adults in the criminal justice system, who are mostly men, has fallen in recent years, but figures suggest 18 to 25-year-olds still account for up to 40% of the criminal caseload. They also have the highest reconviction rate, with 75% returning to crime within two years of being released. But the report argued that they also had the greatest potential to stop offending as they "grow out of crime". Weeks after his 18th birthday, Mario tried to stab the driver of a car multiple times and injured the person's shoulder. He was sentenced to four years in prison and served two years and eight months. Mario did not like being separated from his family, he told the BBC Victoria Derbyshire programme: "It was hard to understand that 'Now I'm wasting my life in here sitting in a cell when I could have been studying, trying to get a job trying to do things that are positive'." Image caption The Ministry of Justice says it recognises the challenges posed by the 18-25 age group. When he reoffended three years after he was released, Mario said "I went back to prison for the simple reason that there was no support. "I really wanted to change; I wanted to get a house, I wanted to get a job, I wanted to get an apprenticeship, to do something positive - but the reality is that there was nothing there. "I wasn't aware of what I was doing fully, so I needed support. I needed support in the sense of showing me what's right and what's wrong... or maybe 'How do I overcome the wrong to turn it into a right thing?.'" Speaking to the programme, another former offender, Suleman Amad, said the courts "had no other choice" when they put him in prison for a drug offence after he was tried at the age of 18, although he was 17 when he committed the crime. He said that adult probation was very different to the "intensive and really supportive" treatment given to youth offenders, which he did not have. Mr Amad said some offenders rely on their youth offending worker and see them as a "glimmer of hope". "The minute you turn 18 and are put on adult probation it's very different and the responsibility is mainly down to yourself - which for a lot of young people means they end up reoffending because they can't cope without the intensive supervision they were getting," he said. The general secretary of the Prison Officers Association, Steve Gillan, told the Derbyshire programme it was "totally wrong" to say anyone under the age of 25 is not an adult. He added that the committee and its report were "forgetting about the victims of crime". Mr Gillan agreed that people should be diverted away from prison but questioned where the extra resources and funding would come from. Alex Hewson, of the Prison Reform Trust, said: "A justice system which throws young people off a cliff edge on their 18th birthday, and expects them to fend for themselves in the adult system when they are still maturing and often vulnerable, is not one that is set up to deliver for offenders, victims or local communities." A Ministry of Justice spokeswoman said: "Significant efforts have been made to divert young people from custody and this has resulted in a welcome reduction in the prison population - down 40% since 2010. But those in custody are in for longer and for more serious offences. "We recognise the specific challenges associated with this age group and are committed to addressing these." Can young adult offenders be diverted into work? Video Young offender institutions: What is life like for inmates? How do you treat very young sexual offenders?